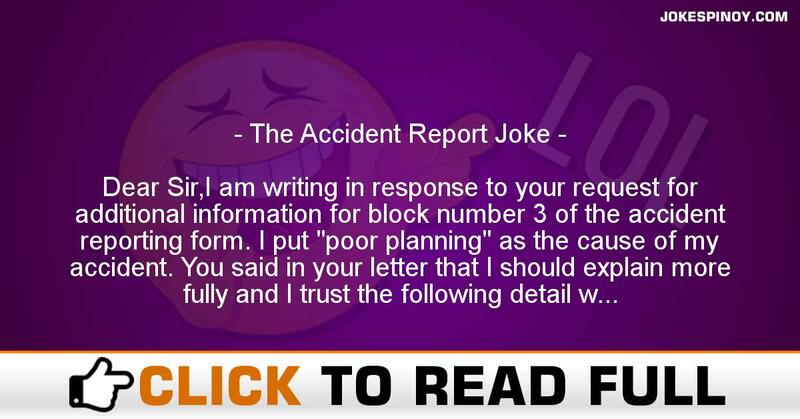 Dear Sir,I am writing in response to your request for additional information for block number 3 of the accident reporting form. I put “poor planning” as the cause of my accident. You said in your letter that I should explain more fully and I trust the following detail will be sufficient.I am an amateur radio operator and on the day of the accident, I was working alone on the top section of my new 80 foot tower. When I had completed my work, I discovered that I had, over the course of several trips up the tower, brought up about 300 pounds of tools and spare hardware. Rather than carry the now un-needed tools and material down by hand, I decided to lower the items down in a small barrel by using a pulley, which fortunately was attached to the gin pole at the top of the tower.Securing the rope at ground level, I went to the top of the tower and loaded the tools and material into the barrel. Then I went back to the ground and untied the rope, holding it tightly to insure a slow decent of the 300 pounds of tools. You will note in block number 11 of the accident reporting form, that I weigh only 155 pounds. Due to my surprise of being jerked off the ground so suddenly, I lost my presence of mind and forgot to let go of the rope. Needless to say, I proceeded at a rather rapid rate of speed up the side of the tower. In the vicinity of the 40 foot level, I met the barrel coming down. This explains my fractured skull and broken collarbone. Slowed only slightly, I continued my rapid ascent, not stopping until the fingers of my right hand were two knuckles deep into the pulley. Fortunately, by this time, I had regained my presence of mind and was able to hold onto the rope in spite of my pain.At approximately the same time, however, the barrel of tools hit the ground and the bottom fell out of the barrel. Devoid of the weight of the tools, the barrel now weighed approximately 20 pounds. I refer you again to my weight in block number 11. As you might imagine, I began a rapid descent down the side of the tower.In the vicinity of the 40 foot level, I met the barrel coming up. This accounts for the two fractured ankles and the lacerations of my legs and lower body. The encounter with the barrel slowed me enough to lessen my injuries when I fell onto the pile of tools and fortunately, only three vertebrae were cracked.I am sorry to report, however, that as I lay there on the tools, in pain, unable to stand and watching the empty barrel 80 feet above me… I again lost my presence of mind. I let go of the rope. ABOUT US : Laughter is the greatest medication as the old saying says, we at JokesPinoy.com will supply you with all the amusing filipino quotes and photos in tagalog language. Back in 2013, a group of Filipino OFW (Overseas Filipino Worker) got bored and they try to look for some funny quotes on the net just to have fun but unfortunately most of the websites they found on that time are having an aged jokes and have no interaction with the users. From that instant, they subsequently got an idea to build their very own jokes website and let other users to give their jokes or comment together with the present jokes. Following the funds and ideas accumulated, JokesPinoy.com was born, a website that let the user share their jokes and let them have dialog with other users too. Since the website has been launching, thousands of visitors are coming each day to read jokes and have fun on the website and as well as giving their opinion on the jokes they read. We hope from JokesPinoy.com this website may provide you some smile and happiness, Life is Short so have fun on it. DISCLAIMER: A number of the jokes, photos and videos found in this site are not created by us, they can be made by our users or they simply get it someplace in the internet only like 9gag, youtube, metacafe, vimio and etc. We regard copyright info that is posted here including funny pictures and humorous videos. If encase there are files posted here in our site which is owned by your and you don't want to share it to anybody subsequently fell free to contact us to remove it. Most of the language used on this site was in tagalog and some are bisaya that are both filipino language which originated from Philippines, if you wish to interpret the joke to english you can used an online translator to interpret it from tagalog to english.